A couple months ago, Yahoo and BestBuy decided to nix virtual teams due to productivity issues. However, we have seen success story after success story on how virtual teams are more productive. These teams are elevating companies to the next level while keeping cost low. And yet, we still see failure in the virtual world marketplace. Now more than ever, technology, systems and accessibility of amazing talent can come together to bring productivity to an all time high (if done correctly). Virtual team development is at the heart of this process. We were thinking about the challenges our virtual business friends face every day. In fact, we totally understand, because we are right there with you. Our company started in Barcelona, Spain. Now, we have a growing team in Redwood City, California. Sure, we have face-to-face meetings. But most of the time, our meetings look like the image above. So, here’s the gameplan. We are taking the dozens of case studies we have collected over the past few years to create a road map of success for virtual teams. This roadmap will be shared via our new blog series – Avoid the Death of Your Virtual Team, A Roadmap to Success. Many of our clients have asked us to clarify and guide them through aspects of applying effective business structures to their virtual teams. I compare the virtual team dilemma to the small business dilemma of survival. Have you ever read the E-Myth by Michael Gerber? Like this classic book emphasizes, the discipline of effective teams and/or businesses is all about systems. You have your organizational, marketing, business development, management, and people systems. Although, these systems are often based on a brick and mortar world. 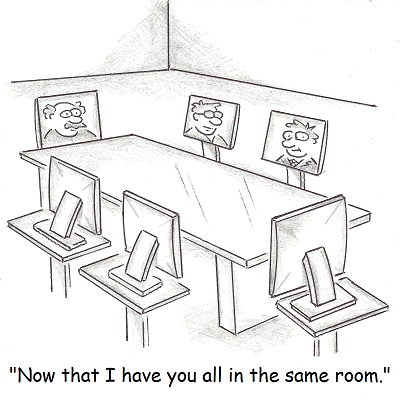 Do you have your systems in place for your virtual teams? No worries! This is where our lessons from our amazing clients and our team’s experiences come into play. From our perspective, we know that there are a significant amount of successful virtual teams across multiple business spectrums that have discovered how to make virtual teams work, while also experiencing high levels of business growth. We hope this blogging series will offer both of our new and existing virtual business friends with the opportunity to approach their business and/or work with a new sharpness and vigor through our Avoid the Death of Your Virtual Team, A Road Map to Success. So, for the next several weeks, we will be sharing the stories of our clients. We will be sharing what the leaders of extraordinary virtual teams know that the rest of us don’t. You will be hearing from our entire team. Our founder, Pablo Villalba Villar, will be sharing his insights on systems for developing products with a virtual international team. Our CEO, Dan Schoenbaum, will cover several issues. Most importantly, he will cover your people systems. This is where most companies fail in the virtual world. Our team will share with you every important aspect of building a productive and effective virtual team.